Crazy Rich Asians (film, 2018). A 2018 American romantic comedy-drama film with "PG-13" rating by Warner Bros. Pictures. Directed by Jon M. Chu. Official Trailer. Crazy Rich Asians is a 2018 American romantic comedy-drama film directed by Jon M. Chu. In 2018, Nick Young and his girlfriend Rachel Chu, an economics professor at New York University (NYU), travel to Singapore for the wedding of his best friend Colin to Araminta. In Singapore, Rachel visits her college friend Peik Lin and her family, who are shocked when Rachel tells them that she is dating Nick Young. Peik Lin explains that Nick's family is extremely wealthy and well-known and that Nick's high-society family and friends will give her a cold reception, but Rachel is unconcerned. At a dinner party at Nick's family estate, Nick introduces Rachel to his mother Eleanor, while Nick's cousin Astrid discovers that her husband Michael, a former military captain, has been having an affair. Rachel worries that Eleanor dislikes her, although she seems to make a good impression on Nick's grandmother Su Yi. Rachel attends Araminta's bachelorette party, where she is confronted by Amanda, who reveals that she is Nick's former girlfriend. Rachel returns to her hotel room to find it vandalized, and is comforted by Astrid, who tells her about Michael's affair. Nick attends Colin's bachelor party, where he tells Colin about his plan to propose to Rachel. Colin expresses his concern about the trouble it will cause Rachel, especially with Nick expected to stay in Singapore and run his family's corporation. Rachel vents to Nick about the bachelorette party, and he apologizes to her for not telling her about his family before. He takes her to make jiaozi dumplings with his family, where Rachel admires Eleanor's emerald engagement ring. Later, Eleanor recounts the sacrifices she made to become a part of the Young family, privately telling Rachel that she will never measure up. Rachel is hesitant about attending the wedding, but Peik Lin convinces her to go and stand up to Eleanor. While driving to the wedding, Astrid confronts Michael about his affair. He partially blames his unhappiness on her and the great financial disparity between them, then gets out of their car en route. Principal photography began on April 24, 2017, and completed on June 23. 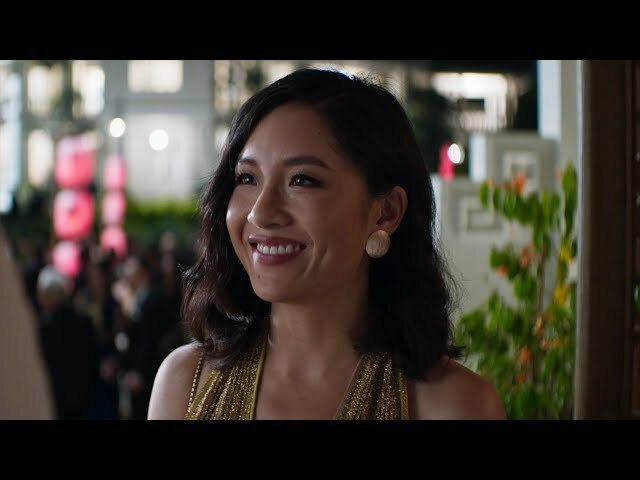 The film Crazy Rich Asians was scheduled to be released by Warner Bros. Pictures on August 7, 2018 (TCL Chinese Theatre), on August 15, 2018 (United States) and on August 17, 2018. The duration of the film is 121 minutes. With a budget of $30 million, the film grossed over $238.5 million. Crazy Rich Asians got high rating from critics. The audience also likes the film. Audiences polled by CinemaScore gave the film an average grade of "A" on a scale ranging from A+ to F.